If I were told I was going to die today, I’d have to say I never took a gamble. I played life too close to the vest. I’ve been afraid my whole life. I’ll go from the Pacific to the Atlantic without a penny. A cashless journey through the land of the almighty dollar. If I’m offered money, I’ll refuse it. If I see a coin in the road, I’ll step over it. I’ll accept only rides, food and a place to rest my head. Wait and see, it’ll work. And so, on 6 September 1994, McIntyre set off from foot from San Francisco to Cape Fear, North Carolina. Why Cape Fear? [It’s] a symbol for all the fears I know I’ll have to conquer if I’m to go the distance. If I make it to Cape Fear, it will be as a different man from the one who starts the journey. 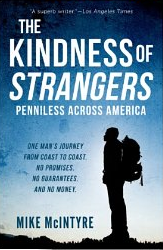 The Kindness of Strangers: Penniless Across America, first published in 1996 and revised in 2010 and 2014, is McIntyre’s wonderful account of what would turn out to be an amazing journey indeed. In his straight-forward and highly-readable style, McIntyre recounts the many and varied experiences he had – and most of all, the many and varied people he met. A few weren’t kind at all – but to McIntyre’s astonishment and gratitude, many of the strangers he met were. Some of them were living happy and well, while some of them were not (and in several cases the stories of their lives are truly heartbreaking) – but whatever their reasons, they helped McIntyre in their own ways and transformed him indeed. Compelling, engrossing, hilarious and moving, The Kindness of Strangers comes highly recommended from this reader. As well, McIntyre’s book resonated with me in two ways. One way relates to my long walks around Sydney. Although my walks are very different in concept I’ve found them rewarding for their own reasons – and although I usually keep to myself with a focus on endurance and sight-seeing, like McIntyre did I’ve also met remarkable people. Like McIntyre, one of my biggest problems in life has been the fear of everything – which in turn led to other problems. As well, back in late 1994 when McIntyre set off on his journey, I was halfway through not only my first post-university decade but also what is still the crappiest decade of my life thus far (including the truly wretched job I was just about to start). Finally, as I’ve previously written about here, last year I had my feelings of mid-life crisis so I can also very much appreciate Kafka’s quote above. Fortunately, like the action that McIntyre took, my long walks have helped to make my life better. This entry was posted in Inspiration, My Story, Reading, Something to Think About, Travel. Bookmark the permalink. Reblogged this on Vikas Acharya.